Bring a taste of Hyrule home with the new Legend of Zelda Rupee Chest Replica, which ships complete with green, blue, and red replica Rupees. Hyrule is something of an unusual place. Not only do its citizens often hang out in ramshackle huts and play host to any visitor that barges into their homes uninvited, they also seem to hide their money in strange places like tall grass and clay pots. It's safe to say that's not so much the case for us here in the real world, but Zelda fans can bring a bit of that twisted Hyrulian logic home with the all-new Legend of Zelda Rupee Chest Replica. 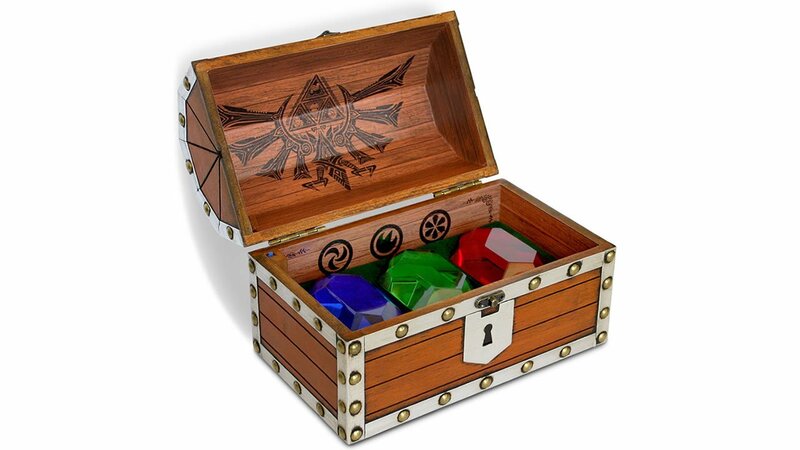 The new collectible Zelda set features a small wooden treasure chest that contains three replica Rupees made out of a transparent acrylic. Check out all the important details in our unboxing video featured below. The box itself seems about on-par with what Zelda fans might expect from a replica treasure chest, but things seem to fall apart when it comes to careful handling of the packages themselves, as two of the three replica Rupees in the set were seemingly damaged in transit. Assuming this is something of a fluke, buyers will be treated to some rather handsome Rupees that can be scattered in random places around the house — or used as paperweights, in the assumption that pinning down errant papers is a problem people still have in 2018. Zelda fans can pick up the Legend of Zelda Rupee Chest Replica right now through Gamestop stores or through Gamestop online, where the product costs $99.99. For more great videos, including games convention coverage and developer interviews, be sure to check out Shacknews and GamerHub.tv over on YouTube. Wow for $100 bucks they should really have better packaging and decent quality rupees. Being all chipped is unacceptable. Yeah those would be going back. I wouldn't accept that level of damage in a $10 product much less a $100 display piece. That thing looks like it'd cost $15 - 20. Even at that price, damaged rupees would be an instant return. $100 is a joke. Wow.